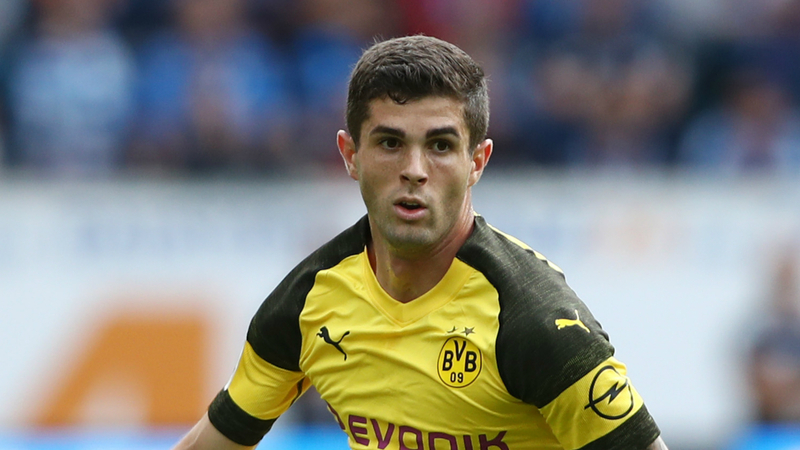 Christian Pulisic insists he will remain 100 per cent committed to Borussia Dortmund's title push despite agreeing to join Chelsea for €64million. The United States international will stay with Dortmund to the end of the season as Lucien Favre's side aim to hold on to a six-point lead atop the Bundesliga. Pulisic will then head to Stamford Bridge for the 2019-20 season, with Chelsea securing the versatile forward despite reported interest from Premier League rivals Liverpool. And the 20-year-old has said goodbye to Dortmund in a lengthy letter where he thanked the club for playing a key role in his development. "Liebe Borussen, It is with a heavy heart that I announce that I will be entering my final months at (y)our world-famous club," Pulisic wrote in a statement released on social media. "It feels like only yesterday that I arrived in Dortmund as a raw, excited, very nervous but exceptionally proud 16-year-old from a small American town called Hershey. I had no idea what lay ahead but I soon discovered that as a young Schwarzgelben, I would be in the best possible hands. "I would not be where I am today without the club and their belief in giving young players a chance. It's been an honour and a dream to pull on the black-and-yellow in front of the Sudtribune! "Many, many memorable moments stand out - to have experienced all of them before my 20th birthday still feels, at times, like a dream. I would like to thank all those coaches who I have played under and who gave me these opportunities. "And to my amazing team-mates throughout the years: You took me in as a young boy, shared your experience with me, helped me to develop and grow into a professional footballer. For this I sincerely thank you. "To our unbelievable fans: It's been a privilege to stand with you on the Sudtribune and to experience how you support your heroes. I feel honoured to have been able to make the trip from being a supporter, to being supported. You have taken me in as one of your own. Thank you." Dortmund's sporting director Michael Zorc said in a statement that Pulisic's contract situation, with his deal set to expire in 2020, persuaded the club to cash in when Chelsea came in with a lucrative offer. And Pulisic praised Zorc and Dortmund's chief executive Hans-Joachim Watzke for allowing him to seal a dream move to the Premier League while reaffirming his short-term commitment to BVB. "I would also like to thank Mr Watzke and Mr Zorc," Pulisic continued. "It was very important to me that I handled my situation in as fair and professional manner as possible towards the club. So I thank them for finding a solution that was a win-win for everyone. "In summer of 2019, I move on to Chelsea and to and to a new competition, the English Premier League. It's a privilege to have signed for such a legendary club and I look forward to working hard towards being a contributor to their team of world class players. Looking forward to working with Maurizio Sarri and his technical team. "But for the next six months, it's all BVB! Please do not doubt my passion, determination and my 100 per cent commitment to the team right until the last ball is kicked this season. We all feel that this is 'our year' and we are determined to achieve the best possible results in all competitions.